Our best bet is you! We can ensure that TeamUP will fit most of your needs and help you to develop an outstanding brand. Ever felt overwhelmed with your workload? Got lost in upcoming meetings and events? We will help you to create your own workflow and offer the tools you need for your sports club or esports organization. Managing team data, scheduling events, sharing files and organizing your tasks can be as easy as a few mouseclicks. We started the same way you did. Searching for a platform to create an amazing brand and make the life of everyone easier. Ecore was built around that, and puts you into the focus. Get ready in no time, setup only takes a few minutes! Struggling to keep up with everything what happens in your club or currently launching a fresh one? Start in no time with the tools TeamUP offers. 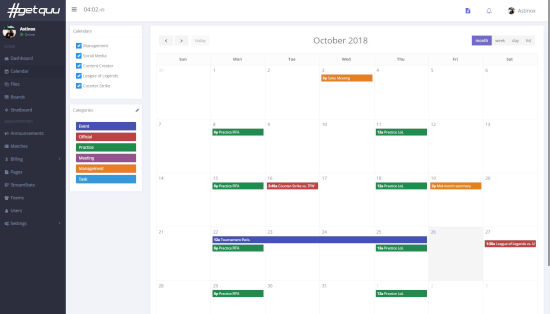 Fast and easy-to-use calendar for multiple teams. 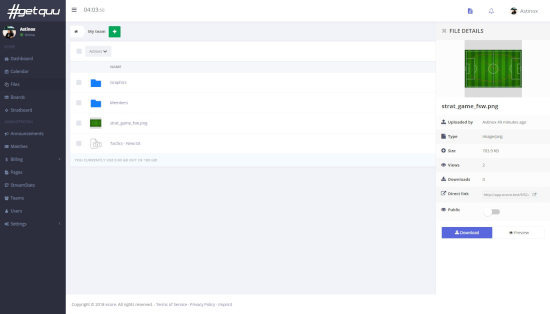 Assign events to multiple users or teams, add recurring trainings or notify your members about a new event. 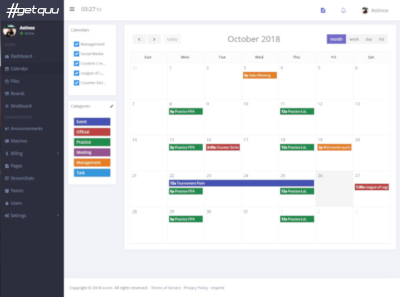 The calendar is fully integrated into the other modules, matches and open tasks are automatically added. The TeamUP file cloud offers you full control. Upload previous match reports, important graphics or contracts. The cloud comes with an extensive permission system which allows folder-based access and easy file-sharing abilities. 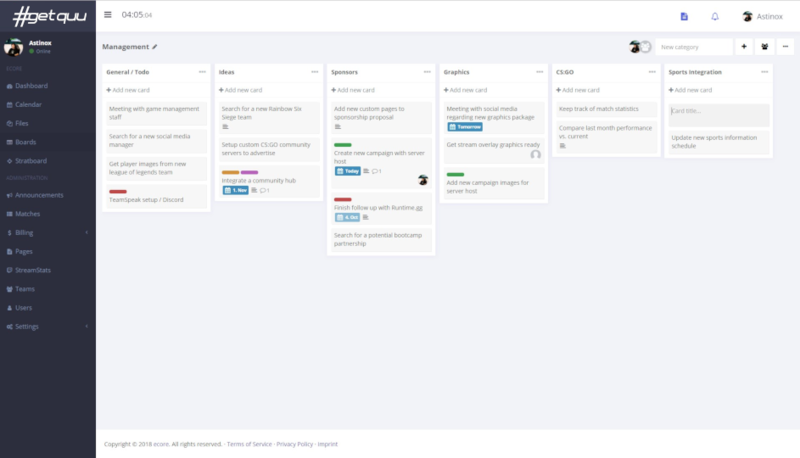 The project management boards allow you to create your personal workflow. Add new categories and attach simple sticky-note like cards to it. 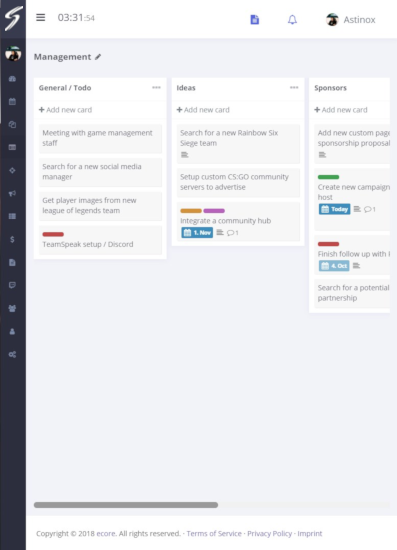 Boards are amazing for any usecase: Social media scheduling, event preperation, team management. Ditch those old excel lists and upgrade to a better overview. 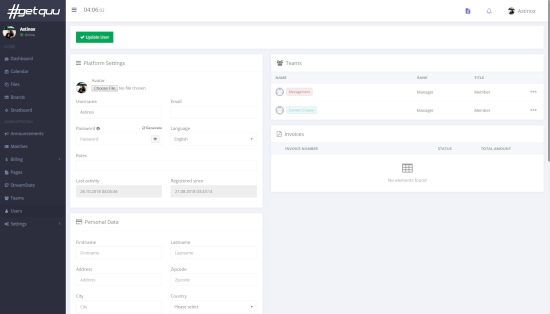 Manage your users and teams directly in TeamUP and add custom profile fields for additional information you might need. Any team which wants to take the next step to professionalization! Time is money. We help you spending less time on work, while you can focus on building an amazing brand! You are ready to go in seconds. Sign up, choose your package and get started. Stop spending hundreds of hours with management each year and let us do the work. Successful people are great in communicating. Our platform was built around that core. We will deploy new updates instantly when they are ready to use, with little to no downtime. We got you! We take care of your backoffice while you manage your club. Manage your business contacts and track your activity. Create and generate invoices for your members or partners and access your finances from anywhere. Any features missing? Email us so we can help you out! Sometimes easy things can be overwhelming. Is ecore available for free? Yes. We have a limited free version available for smaller and upcoming teams. We believe that quality is important, for anyone. Check out our pricing page for more information! We are always interested in sponsorships and extended partnerships. If you think that your club can match the core principles of ecore, email us at info@teamup.management. Please attach a small presentation about your team. Yes! In case you are interested in working with ecore, mail us at info@teamup.management or contact our support team on the website and we will reach back to you! Definitely yes! You can contact us at info@teamup.management to let us know your needs. If your suggestion represents any value for a broad range of our customers we make sure to integrate it. Try ecore now... and love it forever! ecore is your management solution for sports clubs and esports organizations.